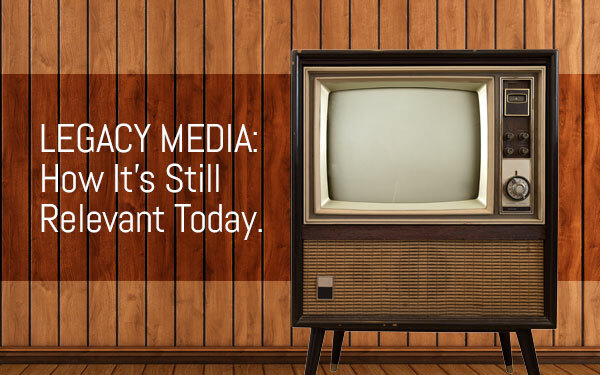 When we think of legacy media, also known as newspaper, television, and radio marketing, we might assume it’s just that: a legacy. However, legacy media is going strong today, with a reported 69% of Americans still reading their newspapers (whether online or in-person), as well as nearly all Americans still listening to AM/FM radio every month. Just because legacy media doesn’t come with the shiny bells and whistles of new media doesn’t mean it’s not still incredibly relevant today. Coverage: Although we’re constantly exposed to increasing numbers on social media, did you know that something as simple as radio still carries the broadest coverage? According to News Generation, 93% of Americans listen to AM/FM radio at sometime during the month over the airways. Right now, that’s higher than the 83% with smartphones and the 50% using laptops to gather their daily updates and information. Local Targeting: Social media encompasses the entire world and all 3 billion people using the apps every single day. As a result, the scope is global, which means the capability to feel hyper-local is no longer available. With legacy media, local newspapers and tv channels only broadcast to people in that specific region. If your business is one that relies on local patronage, you need to consider the angle of legacy media. Legitimacy: There’s something incomparably professional about reading a press release or article about a business in a newspaper. Due to the rampant fake news problem that has developed as a result of instant-click publishing capabilities on social media sites today, someone has to vet a newspaper article before it’s published. That means time went into the story and that it’s factually accurate – or at least accurate enough to run under that paper’s name. Reading about the business through this lens screams legitimacy in a way that social media just can’t. Permanence: When an article is run in a newspaper, it’s archived for eternity. However, when an article graces the front of your Facebook page, it can quickly disappear into the sands of time. This kind of permanence is critically important for your SEO rankings, not to mention credibility as an establishment for years to come. The best answer to your marketing challenges is a combination of social media marketing and legacy media. It’s mistake to discount the power of legacy media in today’s landscape, providing you with legitimacy, permanence, and hyper-local targeting capabilities. And remember, its coverage is still superior to that of mobile devices, tablets, and laptops…despite what some sites might report.